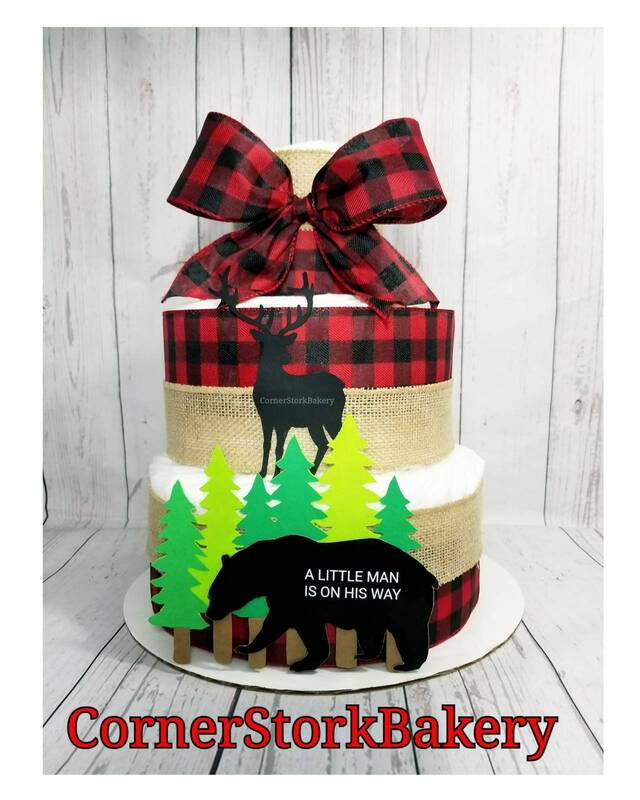 This red and black checkered plaid and burlap ribbon Outdoors/Forest/Woodland with Animals Diaper Cake makes a great baby shower gift for that special someone who likes the great outdoors. It makes an adorable centerpiece for the baby shower. All nicely wrapped up in a cellophane bag with matching ribbon and a handmade gift tag. ☆ Looking for matching Mini Diaper Cakes for the guest tables? I can add them to your order for $11. each plus shipping fees. Each Mini Diaper Cake Includes- 8 diapers, ribbons, crepe paper & cellophane bag with matching ribbon and a handmade gift tag. Send me a message of how many you need & we can get your order started. The Outdoor diaper cake came on time and looked exactly like the picture. They also added some extra personal touches, such as a small plaque with the babys name and mints. I would definately recommend this company.